It also notes that the activity on Twitter is dominated by a small percentage -- most users rarely tweet, while the most prolific 10 percent are responsible for 80 percent of tweets from U.S. adults. Pew says only around 22 percent of American adults today use Twitter, and they are representative of the broader population in some ways, but not in others. For starters, Twitter's U.S. adult users tend to be younger. 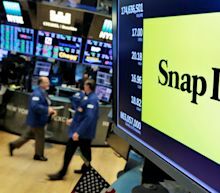 Snap Inc, the parent company of Snapchat, reported first quarter earnings on Tuesday . Twitter stock surges after reporting better than expected earnings. The social media platform also added 330 million users in the first quarter. Yahoo Finance's Zack Guzman and Heidi Chung are joined by Ian Wishingrad, BigEyedWish Founder and Creative Director, to discuss. Yahoo Finance's Julie Hyman, Adam Shapiro, Emily McCormick, Sibile Marcellus and Dan Roberts discuss Twitter's robust earnings. A new Pew Research Center survey maps the differences between Twitter users and the general U.S. population. Pew estimates that 80% of all tweets from U.S. adult users come from just the top 10% of Twitter users, and they are mostly women. The survey also finds that U.S. adult Twitter users tend to be younger and more likely to identify with the Democratic Party than does the overall population. Wall Street closed sharply higher on Tuesday buoyed by strong first-quarter 2019 earnings results. After a sometimes tense debate that lasted more than eight hours, the Lower House Constitution and Justice Committee voted 48 against 18 that the bill is constitutional and can proceed in Congress. Bolsonaro still faces a long road to get final approval for the proposal that is to fix the country’s battered public accounts and help cut public debt.